Very few people enjoy moving. It is a necessary job most people avoid. However, it is a necessity of life that we all face, often at many times in our lives. Moving is inconvenient. It can also be costly. In this article we will give some suggestions on how you could save a few dollars on your next move. While some costs are unavoidable, like the cost of movers or renting a moving van, taking care of smaller items could produce significant savings. Start moving, packing and cleaning your house as soon as you can. When you are prepared you won’t be spending extra money on boxes, storage costs or perhaps rush moving fees. As soon as you know when you are moving, book your moving company. Some moving companies offer mid-month moving discounts. You might save money by moving in the middle of the month, rather than at the end. 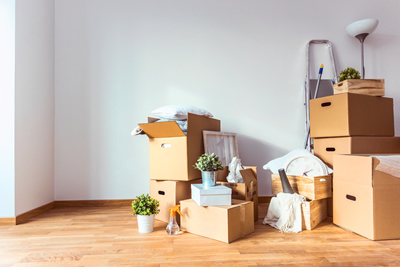 If you start planning your move early enough, you may be able to gather enough packing supplies from friends, neighbours and businesses. Have a garage sale in plenty of time before you move. Why pay to move items you no longer need? When you are organized both on moving day and by having your items packed appropriately, you could save money. Overtime costs you money. On moving day, be ready. Pack items in strong and secure items before moving day. Label cartons to ensure correct placement in your new home. To make for a smoother move, remove the items you will be moving yourself, like plants and valuable, before the movers arrive. Move garden tools, lawn mower, patio furniture and other backyard items to the front for faster loading. Clear as much of the basement as you can. Even bringing smaller boxes closer to the entrance will save time. Disassemble as much furniture as possible. Take apart swing sets and other large items. Take beds and tables apart, taping screws to a prominent part of the furniture. Remove necessary doors to ensure a quicker move. Be sure the driveways and sidewalks are clear when the moving van arrives. If you are moving from an apartment, ensure the elevator is free for the time of the move. If moving appliances, remove hoses from the washer and dryer to prevent damage to walls and floors. Place hoses inside the appliance for easy recovery. Carry small items and boxes. Avoid carrying heavy and awkward items that require two people. As much as possible, keep children and pets out of the way during moving day. Ideally, perhaps a neighbor could watch the children and care for the pets on moving day. Before leaving the house, check to see that all items have been loaded. Be organized. Have movers place boxes directly in appropriate rooms. This saves time and money. As much as possible, assemble furniture items yourself. Assist with moving smaller items. When you are prepared, organized and try to do as much of the moving as you can, you will go a long way to saving money! Perhaps the money you save can contribute to a house warming gift or party!